The median price of homes for sale is higher than the median home value of all homes in all but three of the largest 35 U.S. metros. Monthly mortgage payments on for-sale homes in Los Angeles require 46.8 percent of the median income. Monthly payments for the median-valued U.S. home require 16 percent of the median income. The Q1 2017 U.S. Home Flipping Report shows that 43,615 single family homes and condos were flipped nationwide in the first quarter of 2017, down 8 percent from the previous quarter and down 6 percent from a year ago to the lowest number of homes flipped since Q1 2015 — a two-year low. Home flips in Q1 2017 accounted for 6.7 percent of all single family home and condo sales during the quarter, up from 5.8 percent in the previous quarter and unchanged from a year ago. 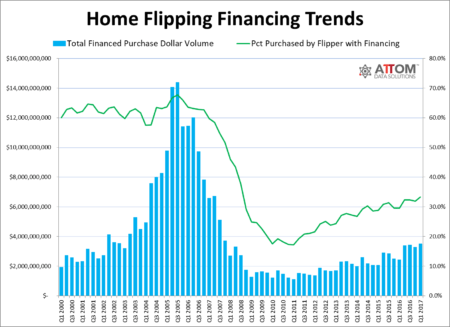 One-third (33.3 percent) of all single family homes and condos flipped in Q1 2017 were purchased by the flipper with financing, up from 31.9 percent in Q4 2016 and up from 29.5 percent in Q1 2016 to the highest level since Q3 2008. Among 85 metropolitan statistical areas with at least 90 completed home flips in Q1 2017, those with the highest share originally purchased by the flipper with financing were Colorado Springs, Colorado (69.3 percent); Denver, Colorado (54.8 percent); Seattle, Washington (51.6 percent); Boston, Massachusetts (51.3 percent); and Providence, Rhode Island (47.3 percent). The District of Columbia had the highest home flipping rate in the nation in the first quarter (10.7 percent), followed by Nevada (9.8 percent); Alabama (9.0 percent); Tennessee (8.9 percent); Maryland (8.5 percent); and Missouri (8.0 percent). Homes flipped in the first quarter of 2017 were sold for a median price of $200,000, a gross flipping profit of $64,284 above the median purchase price of $135,716, up from a gross flipping profit of $63,500 in the previous quarter and a gross flipping profit of $59,100 in Q1 2016 — a new all-time high going back to Q1 2000, as far back as the data is available. The Fannie Mae Home Purchase Sentiment Index® (HPSI) decreased 0.5 percentage points in May to 86.2. The slight decrease can be attributed to decreases in three of the six HPSI components being larger on net than the three increases. Americans expressed greater belief that mortgage rates will go down over the next 12 months, with that component increasing 5 percentage points. Mortgage applications increased 7.1 percent from one week earlier. This week’s results included an adjustment for the Memorial Day holiday. The Market Composite Index increased 7.1 percent on a seasonally adjusted basis from one week earlier. On an unadjusted basis, the Index decreased 15 percent compared with the previous week. The Refinance Index increased 3 percent from the previous week. The seasonally adjusted Purchase Index increased 10 percent from one week earlier to its highest level since May 2010. The unadjusted Purchase Index decreased 14 percent compared with the previous week and was 6 percent higher than the same week one year ago. The average contract interest rate for 30-year fixed-rate mortgages with conforming loan balances and jumbo loan balances both decreased to their lowest levels since November 2016. Home prices nationwide, including distressed sales, increased year over year by 6.9 percent in April 2017 compared with April 2016 and increased month over month by 1.6 percent in April 2017 compared with March 2017. 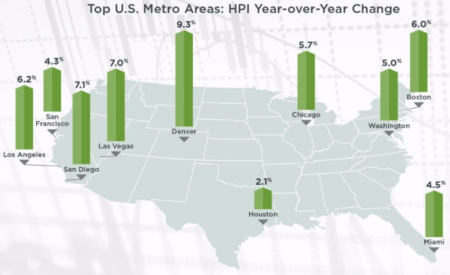 The CoreLogic HPI Forecast indicates that home prices will continue to increase both year-over-year and month-over-month by 5.1 percent and 0.7 percent, respectively. 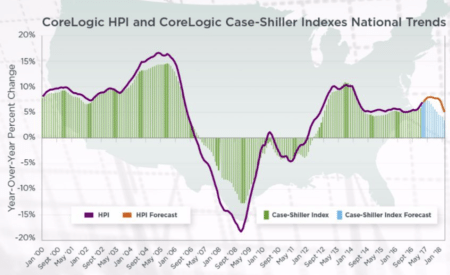 Both the CoreLogic HPI Single Family Combined tier and the CoreLogic Case-Shiller Index are posting positive, but moderating year-over-year percent changes, and forecasting gains for the next year. Fixed-rate mortgage interest rates are down by one-fourth of a percentage point since mid-March. Nationally, the year over year home price changed by 6.9 percent. Most states experienced increases, except Alaska, Delaware and Wyoming, with the largest gains made in Washington (12 percent) and Utah (10.1 percent). Because of the upward interest rate shift seen in Q4 2016, Q1 2017 purchase and refinance originations have both seen significant quarterly declines in volume. Refinance lending among higher-credit-score borrowers saw a quarterly decline of 50 percent. After surpassing their pre-crisis peak for the first time in February, home prices rose another 1.3 percent in March – the largest monthly increase in nearly four years. Email market reports to press@inman.com. Does MLS Offers make for smoother negotiations?